In Part 1 of this posting, which appeared here yesterday, the TTABlog presented half (or maybe six-elevenths) of the Top Ten TTAB Decisions of 2007. The remaining five are summarized below. The decisions are not necessarily listed in order of importance, although they may be. I leave that for the reader to decide. Bose Corp. v. Hexawave, Inc., Opposition No. 91157315 (November 6, 2007) [not precedential]. Opposer Bose lost the fraud battle but won the war in its Section 2(d) opposition to registration of the mark HEXAWAVE for various electronic devices, including amplifiers and tuners. The Board sustained Applicant Hexawave's fraud claim as to one of Bose's pleaded registrations, but went on to find the HEXAWAVE mark likely to cause confusion with Bose's famous WAVE and ACOUSTIC WAVE marks for audio products that include amplifiers and tuners. The claim of fraud against Bose centered on the renewal in 2001 of its registration for the mark WAVE for, inter alia, audio tape recorders. Although Bose stopped offering audio tape recorders in 1996-97, it did not delete those goods when it filed for renewal, claiming that shipment of returned products after repair satisfied the use requirement. The Board noted that Bose offered no case support for its theory that "transporting" a product back to its owner after repair constitutes use of a trademark on the product as contemplated by Section 45 of the Trademark Act. Finding that it was not reasonable for Bose to believe that this shipment of goods that it no longer owned constituted "use" under the Act, the Board (rather harshly) ruled that Bose had committed fraud. (TTABlogged here). CNL Tampa Int'l Hotel Partnership, LP v. Palazzolo, Opposition No. 91163724 (March 7, 2007) [not precedential]. 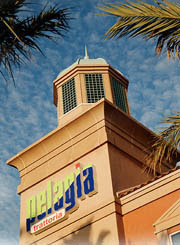 The TTAB dismissed a Section 2(d) opposition to registration of the mark PELAGIA for "clothing, namely shirts," finding the mark not likely to cause confusion with the identical mark for restaurant services. Opposer claimed that clothing "is within the natural scope of expansion for restaurant services." Its only proof of relatedness of these goods and services, however, was a collection of 102 third-party registrations each encompassing both restaurant services and clothing. The Board noted that third-party registrations "may have some probative value to the extent that they serve to suggest that the listed goods and/or services are of a type that may emanate from a single source," but the Board refused to draw the inference that these goods and services are "legally related products" requiring a finding of likelihood of confusion. It noted that acceptance of Opposer's argument would be tantamount to creating a per se rule "that the same or similar marks for restaurant services and clothing is likely to cause confusion." Taken to the "absurd extreme," if third-party registrations alone were sufficient to prove relatedness of goods and services, "then virtually all consumer products and services would be related." (TTABlogged here). Hormel Foods Corp. v. Spam Arrest, LLC, Cancellation No. 92042134 (November 21, 2007) [not precedential]. 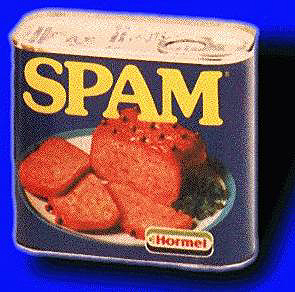 The Board dismissed Hormel's petition for cancellation of a registration for the mark SPAM ARREST for "computer software, namely software designed to eliminate unsolicited commercial electronic mail," finding that Hormel had failed to prove likelihood of confusion and dilution vis-à-vis its famous mark SPAM. Likelihood of Confusion: Respondent conceded the fame of the SPAM mark for purposes of Section 2(d), and also conceded that Hormel owns a family of SPAM marks. It was undisputed that "spam" is a generic term for unsolicited commercial e-mail. "This dichotomy between the fame of petitioner’s trademark and the generic meaning of the same term" was crucial to the Board’s 2(d) determination. Although the Board gave "great weight" to the fame of the SPAM mark, "that fame does not extend to computer software." Dilution: The Board found that Hormel had proven SPAM to be famous for canned meat but failed to prove that its mark is "distinctive" for dilution purposes – i.e., "that the mark has become the principal meaning of the word." Hormel's dilution by tarnishment claim was given short shrift, being based on a few Internet postings dissing Respondent's software. And so, Hormel's petition for cancellation was scraped off the Board's plate and into the trash can. (TTABlogged here). In re Valenite Inc., 84 USPQ2d 1346 (TTAB 2007) [precedential]. In view of the "prevalence of online retailing" and the specialized nature of Applicant's products, the Board found that Applicant's home webpage constituted a "display associated with the goods" and therefore was a proper specimen of use for the mark VALPRO for tools for power operated metal cutting machines. Applicant relied on Lands' End Inc. v. Manbeck, 24 USPQ2d 1314 (E.D. Va. 1992) and In re Dell Inc., 71 USPQ2d 1725 (TTAB 2004) in arguing that the webpage is a display associated with the goods (Rule 2.56(b)(1)). The Examining Attorney maintained that the specimen of use failed because "the mark is not associated with the goods" and "sufficient ordering information" is lacking. 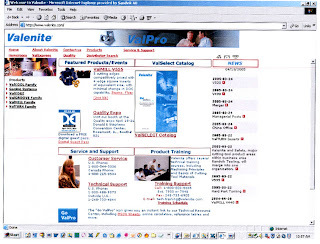 The word VALPRO appears at the top middle of the webpage, to the right of a picture of some of Applicant’s tools. [see below]. A link to an online catalog is provided, along with a toll free number and web links to customer service, technical support, and Applicant’s "Technical Resource Center." The Board found that the webpage satisfies Lands' End and Dell because it (1) includes a picture of the goods; (2) shows the mark near enough to associate the mark with the goods; and (3) contains information necessary to order the goods. (TTABlogged here). Paris Glove of Canada, Ltd. v. SBC/Sporto Corp., 84 USPQ2d 1856 (TTAB 2007) [precedential]. The Board granted Respondent's motion for summary judgment, permitting amendment of its registered mark and finding Petitioner's claims of abandonment, naked licensing, and fraud to be without merit. Respondent convinced the Board to strike from the record a Google "hit list" search summary retrieved via the "Wayback Machine" because it was not properly authenticated. The Board pointed out that Internet materials "may be admissible as evidence in connection with a summary judgment motion, if competent and relevant, provided that they are properly authenticated by an affidavit or declaration pursuant to FRCP 56(e). See TBMP Section 528.04(e)(2d ed. rev. 2004)." Petitioner argued that concerns about authentication no longer exist in view of the availability of the Internet Archive and its "Wayback Machine" feature. According to Petitioner, the "Wayback Machine" shows "each date on which a website has undergone a significant change." The Board, however, observed that the "Wayback Machine" suffers from a serious evidentiary flaw: "What may be insignificant to the archivers for the 'Wayback Machine' may have significance from the standpoint of evidentiary value in a trademark proceeding. Thus, changes to a website, or in this case the excerpts taken from a website that appear in a Google search summary, may not appear in the Internet Archive." (TTABlogged here ).